Christopher Palmer is Senior Director and General Manager of Richardson Gratings (a Newport Corporation business), a world leader in the design and manufacture of diffraction gratings for the analytical instrument, semiconductor and telecommunications markets, as well as for research and education. Chris received a BS in physics from St John Fisher College (Rochester, NY) and an MA and PhD in physics from Bryn Mawr College (Bryn Mawr, PA). His has published a number of papers on grating imaging theory and grating and spectrometer design, and authored the most recent editions of the Diffraction Grating Handbook. Chris is a member of APS, OSA and SPIE. Charles Kankelborg is Associate Professor of Physics at Montana State University. His research interests include ultraviolet instrumentation, observation and modeling of the solar transition region and corona, and solar magnetic fields. Dr. Kankelborg is Principal Investigator of the Multi-Order Solar EUV Spectrograph, a rocket-borne instrument for simultaneous imaging and spectroscopy of the solar atmosphere. He is a Co-Investigator on the NASA IRIS mission. He has received the Wiley Award for Meritorious Research (2010), Presidential Early Career award (2008), and Outstanding Graduate Level Instructor award (2006). Dr. Shaw is the director of the Optical Technology Center, bringing together faculty and students from multiple departments to promote education, research, and economic development in optical science and engineering at Montana State University (MSU) in Bozeman, Montana. He also is a professor of Electrical Engineering and Affiliate Professor of Physics. His Ph.D. is in Optical Sciences from the University of Arizona, and his research is in the development, calibration, and application of optical remote sensing systems to studies of the natural Earth environment. He worked at the National Oceanic and Atmospheric Administration (NOAA) for 12 years before joining the MSU-Bozeman faculty in 2001. Dr. Shaw’s contributions to optics research and education have been recognized with awards that include the Presidential Early Career Award, the Vaisala Award from the World Meteorological Organization (WMO), and election as a Fellow of the Optical Society of America (OSA) and the International Society of Optics and Photonics (SPIE). Wataru Nakagawa is an Assistant Professor in the Department of Electrical and Computer Engineering at Montana State University (MSU). His research interests include the design, fabrication, and characterization of optical nanostructures, as well as their applications in high-performance imaging, optical sensing, and other interdisciplinary fields. He received the Ph.D. in Electrical and Computer Engineering (Applied Physics) from the University of California, San Diego (UCSD) in 2002. Before joining MSU, he worked as a senior scientist and group leader in the Applied Optics group of the Institute of Microengineering in Neuchâtel Switzerland, now part of the Ecole Polytechnique Fédérale de Lausanne (EPFL). Mitch Hobish has been self-employed for over 26 years as a freelance interdisciplinary scientist and technologist, working with private sector, academic, and state, federal, and international governmental organizations. He has worked as a contractor at NASA field centers and HQ on several Earth and space science satellite missions and astrobiology research and planning, and in various capacities with the National Institute of Standards and Technology, the Office of Naval Research, the Department of Defense, the Department of Energy, and the Department of Agriculture. Beyond his science and technological pursuits, Mitch has taught several MBA-level courses in entrepreneurship and leadership, both in the classroom and online, and is a professional career coach. He holds a BA in English from the University of Rochester (with a minor in electrical engineering), a BS in biology from Tulane University, and a PhD in biochemistry from Johns Hopkins University. More information may be found at http://www.sciential.com. Dr. Cassandra Runyon graduated from the University of Hawai’i in 1988 with her Ph.D. in Geology and Geophysics. Following graduation, she was a National Research Council Postdoctoral Fellow at NASA Johnson Space Center. She is currently an Associate Professor of Geology at the College of Charleston, the Director of the SC Space Grant Consortium, and until recently was Director of the Lowcountry Hall of Science and Math at the College of Charleston and the Southeast Regional Clearing House in support of NASA’s Office of the Space Science Education Support Network. In this role, she was responsible for coordinating education and public outreach efforts related to space science for a fourteen state region in southeastern US. She is a member of the Science teams and Lead for the Education and Public Outreach (E/PO) teams for both the Brown-MIT and University of Central Florida Solar System Exploration Virtual Institute (SSERVI) research groups and was part of the science team and EPO lead for the Moon Mineralogy Mapper (M3) instrument that flew on Chandrayaan-1. Jennifer Fowler is the education specialist with the Montana Space Grant Consortium. She works with all of the MSGC student programs including scholarships, fellowships, apprenticeships, internships, and undergraduate research. Fowler serves as a faculty advisor for MSGC's Space Public Outreach Team (SPOT) and has served as the UM-BOREALIS (Balloon Outreach, Research, Exploration and Landscape Imaging System) flight director for the past 10 years. 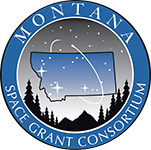 Joey Key is the Education Specialist for the Montana Space Grant Consortium. She works with all of the MSGC student programs including scholarships, fellowships, apprenticeships, internships, and undergraduate research. Dr. Key is the faculty advisor for MSGC's Space Public Outreach Team (SPOT). She is a member of the Montana State University Gravity Group and a Co-Investigator for the Celebrating Einstein outreach project. Larry Springer is the senior research engineer for SSEL at MSU. Mr. Springer left Lockheed Martin in April of 2007, after a 35 year career developing scientific instruments for NASA satellites, to join the MSU SSEL team. Prior to leaving Mr. Springer was the program manager for both the HMI and AIA instruments on the NASA SDO program from the initial proposal until the instruments were in acceptance test. The AIA instrument was not initially selected for SDO, but late in phase A, because of the excellent performance of the HMI team during phase A, the SDO program office requested that Lockheed Martin develop a program plan to include the AIA on the SDO program. Previous to this he was program manager for the Lockheed Martin part of the SECCHI on STEREO from the initial proposal through the completion of the critical design review, the program manager of GOES-N SXI from the initial proposal through the formulation phase to after the critical design review, the project engineer of the MDI instrument on the ESA SOHO program, and the electronics team lead on the CLAES instrument for the NASA UARS program.